From pale and dry to dark and syrupy, there’s a Sherry for every occasion. But, Sherry is a very misunderstood wine style. 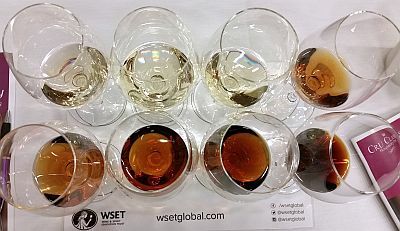 To provide us with more clarity and experience with Sherry we had Lara Victoria, DipWSET of Cru Classe Hospitality Corp to lead us through a WSET Masterclass at the Vancouver International Wine Festival. Lara, besides being a WSET Certified Educator, is also a Certified Sherry Educator Consejos Reguladores del Marco de Jerez. The D.O. Jerez-Xérès-Sherry region forms a triangular area in southwestern Spain covering Jerez, Sanlucar de Barrameda, and El Puerto Sta. Maria. There is approximately 7000 ha of vineyards in the Sherry region. The summers are hot, around 40 degrees Celsius, gets 3000-3200 hours of sunlight, and is affected by 2 predominant winds. The wind from the west, Poniente, provides fresh air and humidity, while the wine from the southeast, Levante, is warm and dry. There are also distinct soils in the region. One soil, Albariza, is caused by the sedimentation of marine diatoms, forming a high content of calcium carbonate. This soil is poor in organic material but very good in water retention, which is important in this hot region. The roots of the grape vines typically go 4-5 meters deep but have been found down to 11 m. Arenas is a soil found in the coastal areas; a mix of sand, clay and less than 20% of limestone. As such the soil does not retain water very well. This soil we are told is best for the Moscatel grape. The last soil, Barros, is located mainly in valleys. It is a mix of sand, clay, limestone, and organic matter. It is deeper in colour and more fertile for grapevines. Palomino is the predominant grape used for Sherry. 98% of the vineyards are planted with Palomino. There are 2 types of Palomino grapes; Palomino Fino and Palomino de Jerez. Fino has low acidity and of excellent quality, while Palomino de Jerez has a higher level of sugar and acidity. Pedro Ximénez has a high sugar contact and higher acidity to produce high-quality sweet wine. Moscatel we were told is best suited to coastal vineyards. It has slightly less sugar and acidity compared to the Pedro Ximénez grape. Vinos Dulces. A naturally sweet Sherry. The wines are made from Pedro Ximénez or Moscatel. Vinos Generoso de Licor. A blended Sherry. Pale Cream, Medium, and Cream are the styles of this Sherry. All Sherries are fortified with pure grape spirit to increase the base wines either up to 15% abv. For Fino style, or up to 17% abv. for Oloroso. The wines are stored in 600 l barrels known as Botas, made from American oak. The barrels are only filled to 500 l to allow space for flor to grow. What is flor? Details to follow. After the base wine is fortified, the wine is then re-assessed to determine which solera system it will go to. What is a solera system? Details to follow. Manzanilla and Fino are the lightest and are formed from the growth of flor, a local natural yeast, covering the wine in barrel, blocking oxygen from interacting with the base wine. Flor consumes alcohol, dissolved oxygen, sugar and glycerine. These two wines are the most delicate of Sherries and need to be treated as white wines once they are opened. For a Sherry to be labelled Manzanilla, its barrel ageing must take place in Sanlucar de Barrameda. It is known to have a yeasty flavour from the flor with hints of almonds and chamomile, and in particular a marine sea breeze salty note. Sanlucar de Barrameda is a specific DO within the DO of Jerez as it has a unique microclimate caused by its coastal proximity, being cooler and having a higher humidity. Fino, as mentioned earlier, is made in the same method as Manzanilla, but is not made in Sanlucar de Barrameda. It also has the yeasty flor flavour, but also is nutty and has hints of olive brine. Amontillado Sherry is an aged Fino that has lost its flor and developed oxidatively, turning an amber colour. It has a nutty flavour, is sweeter and softer than a Fino. Oloroso Sherry develops in the barrel without the protective flor layer, resulting in a Sherry that deeply coloured, is rich and complex. Palo Cortado started off either as Manzanilla or Fino, under flor, but for some reason, the flor dies and the wine is then exposed to the air and begins to oxidize. A barrel detected as having the flor die off, will be removed from its solera to oxidize on its own. Palo Cortado is a rare style of Sherry and can be thought of as a light version of Oloroso. It has the finesse of an Amontillado with the complexity of Oloroso. Oloroso, Pedro Ximénez, and Cream are made in an oxidative style; Deliberatively exposed to oxygen. No flor growth is permitted for this style of Sherry. Deeply rich in aroma and flavour. The Sweet Sherries are made from Moscatel or Pedro Ximenez grapes that are either late harvested or sun-dried to concentrate the grapes’ sugars and acids. These Sherries have no flor in their production. They are partially fermented then allowed to oxidize, making deeply coloured, sweetly flavoured wine. The Pale Cream, Medium, and Cream Sherries are “blended”. They are blended with sweet wine or concentrated grape must. Pale Cream comes from sweetening a Fino or a Manzanilla Sherry. Sweet and light on the palate. A Medium comes from sweetening wines that underwent oxidative ageing. This Sherry can be amber to mahogany in colour, with nutty aromas, and varying degrees of sweetness. The Cream Sherry is also from the sweetening of an oxidized wine. It will have a deep mahogany colour, be full-bodied, sweet, and have prominent nutty and dried fruit notes. If you would like to learn more about Sherry styles, I can recommend the Sherry Notes website. The base wine, once fortified and the wine in barrel is identified to be developed into one of the above-identified styles, will be placed in a solera within a Bodega. A Bodega is a storage area for the barrels to age, that has high ceilings and windows facing the Pontiente winds. A solera is a 3 level stack of barrels, with the oldest aged wines at the bottom level, the next oldest wines in the middle layer, and the newest, youngest wine barrels placed at the top of the solera. When the oldest wines are deemed ready to be bottled and sold, a portion of the bottom level barrels are drained. This leaves space in the barrel, which is then filled with wine from the middle layer. The middle layer is then filled with wine from the top layer. And then the top layer is topped up with wine from the same vintage. 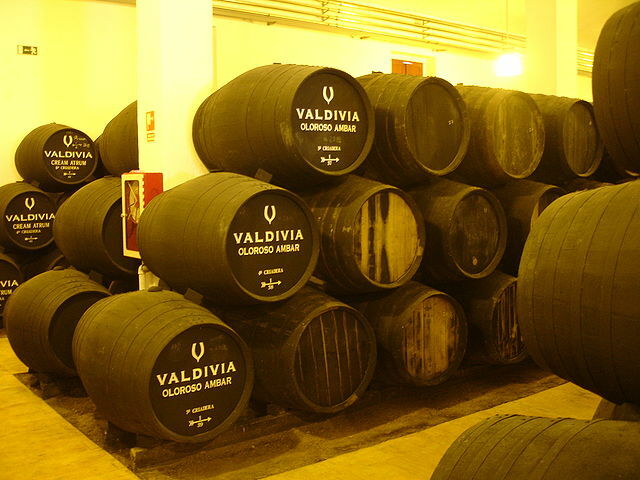 The result is that the sherry from the middle and bottom layers are made of fractions of younger and older vintages. The Sherry drawn off for bottling will, in general, be filtered and cold stabilized. When you drink these sherries there are recommended serving temperatures. Fino and Manzanilla are always chilled to 5-7 degrees Celsius. Oxidative and Blended sherries are served between 12-14 degree Celsius. Thank you to Lara for providing us with all this detailed information about Sherry. Lustau Manzanilla Pasada – bright medium plus lemon in colour. The nose has a medium plus intensity, showing nuttiness, some honey and ripe dried fruit. Also some brininess from the flor. On the palate, the sherry is dry, medium minus body, crisp with medium minus acidity. Salty, citrusy and nutty on the palate. It also has some silky oiliness to it. It finishes peppery. Medium plus length. Pair with Manchego cheese. Tio Pepe Fino – Bright medium lemon colour. Medium minus intensity on the nose. Light citrus, and briny flor and chalky pungency. It is dry with lighter acidity and some roundness. Chalky/stony with some saltiness. Pair with a pear salad. Alvear Fino – this is made with Pedro Ximénez grapes. It is a deeper lemon in colour. Light nose, showing floral and flor. Full-bodied, dry and round, with a thicker mouthfeel. Nutty and oxidative flavours. Bitterness toward the finish. Pair with Indian or Malaysian food. 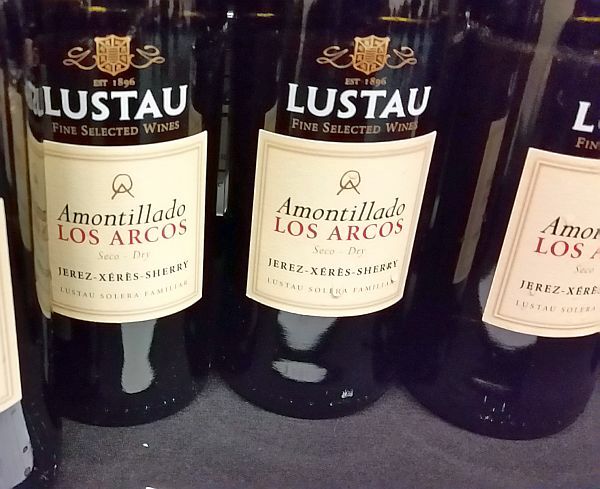 Lustau Amontillado Los Arcos – Bright, medium nut brown or mahogany in colour. Medium plus intensity aromas of sweet brown sugar, nuttiness and lighter flor. An enjoyable nose. Medium plus body, dry, with some saltiness, but also nuttiness and brown sugar flavours. Pepperiness on the finish. Tasty. Pair with antipasti or a mushroom risotto. Lustau Oloroso Don Nuno – medium mahogany in colour. Medium intensity nose; nutty, brown sugar, baking spices and light vanilla aromas. Fuller bodied, dry and round, with lower acidity. Rich flavour of brown sugar. Pair with smoked meat or a dish with nuts. 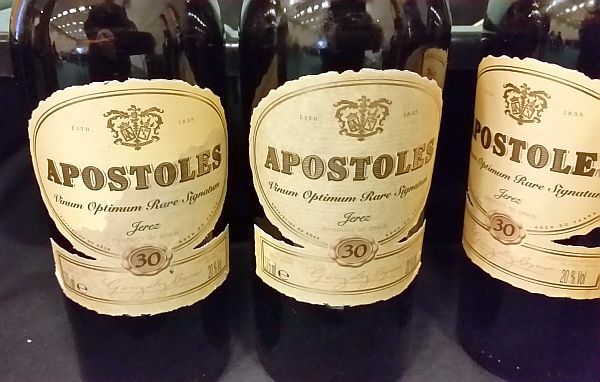 Apostoles Palo Cortado – Deeper mahogany in colour. Rich brown sugar aroma, of light intensity. Off-dry, fuller bodied, round, with higher acidity. Flavours of brown sugar, sweet spices and roasted nuts. Longer length and finishes quite nutty. My favourite sherry of the tasting. Noe Pedro Ximénez – Deep brown in colour. A very sweet, raisiny nose. Luscious, very sweet and thick feeling on the palate. Flavours of prunes, figures, raisins, and brown sugar. Very deep flavours. Tasty but you can’t drink much on its own. 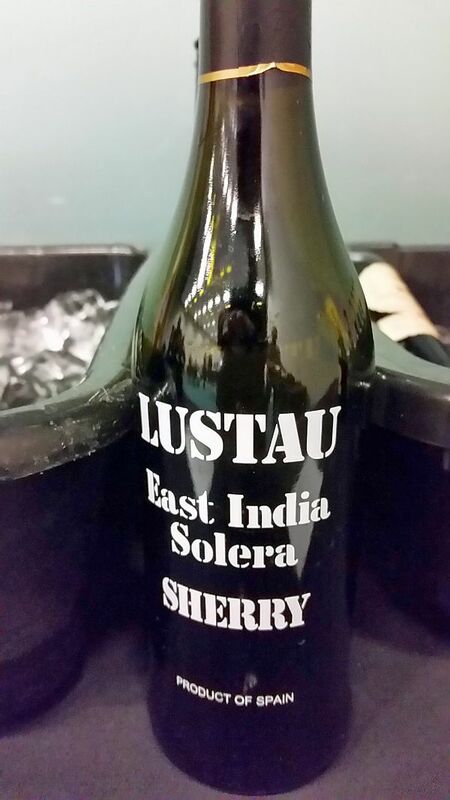 Lustau East India Solera – this is a Cream Sherry, made with 80% Palomino and 20% Pedro Ximénez grapes. This sherry is a deeper chestnut-brown in colour. Fuller nose, deep, rich oxidized sweet fruit aromas. Fuller body and quite sweet. Brown sugar and nutty up front followed by pepperiness toward the finish. Medium plus body and medium plus length. Thank you to Lara for teaching this Masterclass, the Spanish wineries for offering these wines to taste, and for the Vancouver International Wine Fest for offering me a complimentary seat to learn more about Sherry. Nice article. Went to a similar seminar years ago in Vancouver. Very eye-opening both in terms of the variety of styles and the food pairings. Thanks Sean. Too bad we did not cross paths at the Festival this year. I hope you had a great time. Did you find a few new favourite wines? Never made it out of Spain/Portugal, but there were some great table wines from both, in addition to the fantastic fortified & sparkling wines. Lousy notetaking prevents me from being more specific!